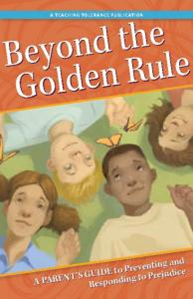 Beyond the Golden Rule: A Parent's Guide to Preventing and Responding to Prejudice (click on the link to download for FREE) is another great publication produced by Teaching Tolerance. The four part book is broken down by age group: Preschool Years, Elementary & Preteen Years, The Teen Years and Part 4: Reflecting Upon Our Own Biases. LOTS of great information!